The Reiderman Residences is a temporary modular housing project in Marpole. It houses 79 former homeless men and women, including 14 of them who are physically handicapped. The temporary buildings will provide much-needed housing for up to 10 years while more permanent housing is built. The Reiderman Residences provides former homeless residents with access to safe, secure homes. The buildings are managed by Community Builders Group, a professional, non-profit housing operator that staffs and manages the building 24 hours a day and provides tenants with supports to help them lead healthy and safe lives. Westside Baptist Church is committed to becoming a good neighbour. 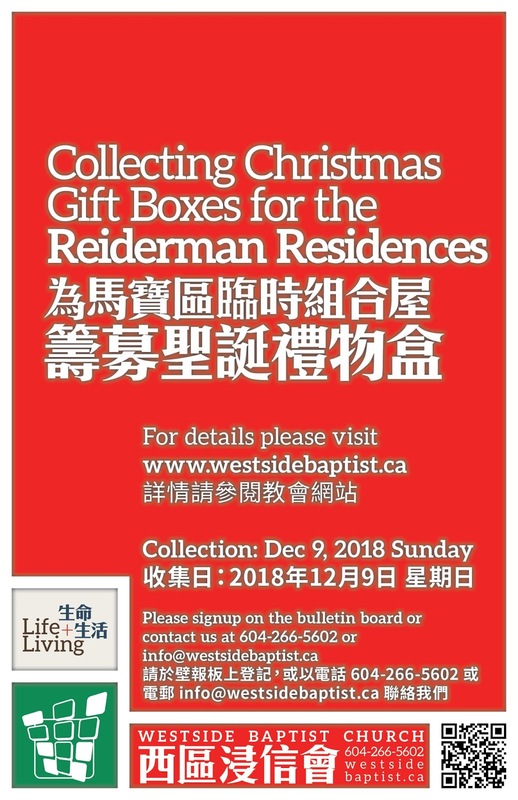 Since occupancy we have been collaborating with various community groups to welcome the residents at Reiderman to Marpole, and witnessing to them the love of Christ. At Christmas, we particularly want to bless the residents with Christmas gifts. Prepare the gift box(es). You can use a old shoe box, or better yet buy a plastic box of similar size. Fill the box(es) with appropriate gift items. Do not giftwrap the box(es) as we will need to check the contents for security reason. Print and put the box top label on the lid, indicating whether the gift is for a male or a female (or either), and who it is from. Send the gift box(es) to Westside Baptist Church on or before December 9. 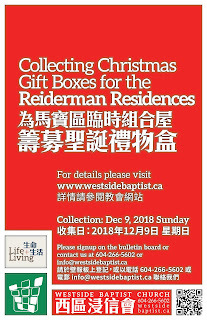 The gift boxes will be delivered to Reiderman Residence on time for Christmas! All items must be new. Do not give used or expired items. Household supplies: soap, detergents, lotion etc. Non-perishable food: cans of meat, hot chocolate, pasta etc. If you are to give money, do it in the form of gift cards, and mark the value on the card. Do not give cash. Do not give anything obscene or offensive.